It seems that Fil-Am artists have been doing a great job at Pixar. Following suit with her former colleagues, Gini Santos visited her home country from November 6 to 7 to celebrate the upcoming release of Disney•Pixar’s "Coco". Currently, Santos serves as Supervising Animator – the first-ever woman in Pixar’s history to hold the position. As for Santos' Pinoy roots, she was born in Pasay City but her family moved to Guam when she was just three years old. She then returned to her home country years later to study at St. Scholastica’s College and the University of Santo Tomas, where she graduated with a degree in Fine Arts with a major in Advertising. Hired by Pixar Animation Studios more than two decades ago in 1996, Santos has worked on many Pixar greats including "Finding Nemo", "The Incredibles", "Ratatouille", and "Up". Gini Santos made an appearance during the special advanced screening of "Coco" on Nov. 6 at Newport Cinemas in Newport Mall, Resorts World Manila. Santos was presented with a plaque of appreciation by the city of Pasay “for being an exemplary citizen of Pasay City”. The award was presented to her by City Administrator Atty. Dennis Acorda, representing Mayor Antonio Calixto. Santos was also awarded by the Original Pilipino Performing Arts (OPPA) Foundation with a plaque of recognition by OPPA President Menchu Lauchengco-Yulo. OPPA is a foundation that aims to support aspiring Filipino artists by providing them with opportunities that will improve their knowledge and craft. On top of that, Santos also conducted an animation workshop on Nov. 7, which was attended by more than 250 students. Here's hoping that Gini Santos' visit will inspire more youth to dream big and win big in life. 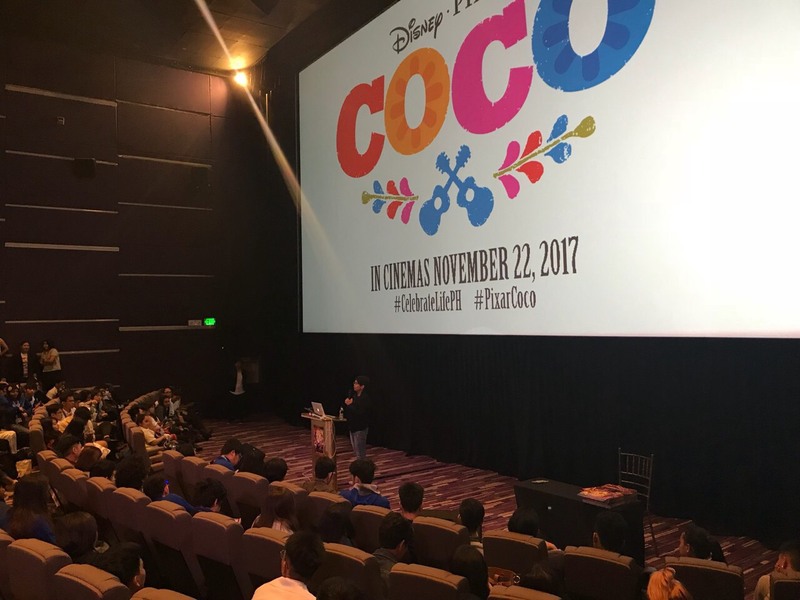 "Coco" opens in Philippine cinemas on Nov. 22, 2017. The film will also feature Walt Disney Animation Studios’ 21-minute featurette "Olaf’s Frozen Adventure".